Marc-Antoine Fortune's first goal for Wigan moved the Latics to within two points of the play-off zone as Yeovil remain two points adrift at the bottom. The French forward turned in a cross from substitute Grant Holt from close range on 78 minutes, having seen two earlier efforts cleared off the line. Wigan winger Marc Albrighton, who is on loan from Aston Villa, also hit the bar for Owen Coyle's side. Yeovil's Joe Edwards had a first-half shot tipped over by Lee Nicholls. Wigan defender Emmerson Boyce made his 200th league start for the Latics. The Barbados international signed for Wigan from Crystal Palace for an initial £1m in 2006, having started his career at Luton. The victory was Wigan's first in the league on their travels since their opening-day thrashing of Barnsley, and the first time they have won back-to-back Championship matches all campaign. And the Latics have now won three out of four matches following midweek Europa League action, drawing the other. Newly-promoted Yeovil achieved their first ever home win in English football's second tier at home to Nottingham Forest a fortnight ago but, despite a bright start, were unable to secure a third win of the season. The Glovers are the lowest scorers in the Football League with just nine goals and their early wastefulness was to prove costly. Yeovil started well with Wigan goalkeeper Nicholls forced into a good save on 21 minutes, tipping Joe Edwards' 20-yard strike over the bar after Paddy Madden's initial free-kick had hit the wall. A couple of minutes later, Madden blasted high and wide after being put through on goal as the hosts continued to spurn some good chances. As the half wore on, the Latics began to take control and should have been ahead after a flurry of chances towards the break. First Nick Powell saw a close-range shot cleared off the line, before Callum McManaman and Fortune also had shots hacked clear by the hosts in a frantic finale. Wigan continued the pressure after the break with Fortune again having a shot hacked off the line on 65 minutes, just seconds after Ryan Shotton's header was desperately cleared away. Striker Holt created the decisive breakthrough when a cross with his first touch was converted by Fortune. Powell could have doubled the lead in injury-time but his heavy touch took the ball away from him. 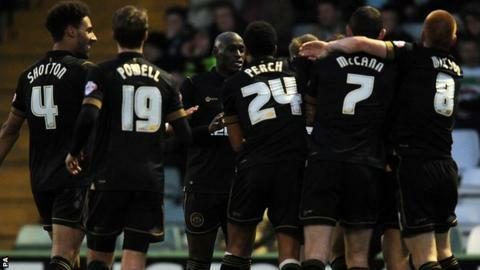 Wigan manager Owen Coyle: "We've been outstanding in the seven games we've played this month. Anyone who's watched our games will know we have a quality side. "I thought we had a slow start in the game, Yeovil bossed it for the first 20 minutes, but in the 10 minutes before half-time there was only one team taking charge, and that was us. "The only reason James McClean didn't play today was because he was injured, it's as simple as that. He would certainly have been involved if he was fit." Yeovil manager Gary Johnson: "Our cup finals are the six or seven teams down the bottom with us, starting with Doncaster next Friday. "We play very well against the top teams, have as much possession and as many opportunities as them, but we never turn those chances into goals and wins. "I'm not burying my head in the sand because I thought the boys worked hard today and gave everything. I love them for that." Match ends, Yeovil Town 0, Wigan Athletic 1. Second Half ends, Yeovil Town 0, Wigan Athletic 1. Luke Ayling (Yeovil Town) wins a free kick in the defensive half. Foul by Grant Holt (Wigan Athletic). Corner, Wigan Athletic. Conceded by Luke Ayling. Corner, Wigan Athletic. Conceded by Sam Hoskins. Substitution, Wigan Athletic. James McArthur replaces Marc-Antoine Fortuné. Nick Powell (Wigan Athletic) wins a free kick in the defensive half. Substitution, Wigan Athletic. Roger Espinoza replaces Marc Albrighton. Attempt missed. Marc-Antoine Fortuné (Wigan Athletic) right footed shot from the left side of the box is close, but misses to the left. Assisted by Ben Watson. Offside, Yeovil Town. Joe Ralls tries a through ball, but Joel Grant is caught offside. Attempt saved. Joel Grant (Yeovil Town) right footed shot from the left side of the box is saved in the centre of the goal. Assisted by Joe Ralls. Substitution, Yeovil Town. Sam Hoskins replaces Sam Foley. Substitution, Yeovil Town. Liam Davis replaces Kevin Dawson. Joe Edwards (Yeovil Town) wins a free kick in the defensive half. Foul by Nick Powell (Wigan Athletic). Attempt missed. Shane Duffy (Yeovil Town) header from the right side of the box is just a bit too high. Assisted by Sam Foley with a cross following a corner. Corner, Yeovil Town. Conceded by Lee Nicholls. Attempt saved. Joel Grant (Yeovil Town) left footed shot from a difficult angle on the left is saved in the bottom left corner. Assisted by Joe Ralls. Goal! Yeovil Town 0, Wigan Athletic 1. Marc-Antoine Fortuné (Wigan Athletic) right footed shot from the left side of the six yard box to the bottom left corner. Assisted by Grant Holt with a cross. Marc-Antoine Fortuné (Wigan Athletic) wins a free kick in the attacking half. Substitution, Wigan Athletic. Grant Holt replaces Callum McManaman. Offside, Wigan Athletic. Leon Barnett tries a through ball, but Marc-Antoine Fortuné is caught offside. Attempt missed. Joe Ralls (Yeovil Town) left footed shot from outside the box misses to the right following a corner. Corner, Yeovil Town. Conceded by Emmerson Boyce. Attempt saved. Joe Ralls (Yeovil Town) right footed shot from outside the box is saved in the bottom left corner. Ben Watson (Wigan Athletic) is shown the yellow card for a bad foul. Joe Edwards (Yeovil Town) wins a free kick in the attacking half. Foul by Ben Watson (Wigan Athletic). Attempt saved. Patrick Madden (Yeovil Town) right footed shot from outside the box is saved in the centre of the goal. Assisted by Joel Grant. Attempt missed. Ben Watson (Wigan Athletic) right footed shot from outside the box is too high. Attempt blocked. Marc Albrighton (Wigan Athletic) left footed shot from the centre of the box is blocked. Assisted by Nick Powell with a headed pass. Ryan Shotton (Wigan Athletic) is shown the yellow card. Attempt missed. Joel Grant (Yeovil Town) header from very close range misses to the right following a corner.